It’s refreshing to know that even now, with everything I’ve read and absorbed to this point in my life, or that as hyper-aware as I am now of tropes, I can still be surprised by a story, in a way that feels genuine and not forced as some kind of shock value. 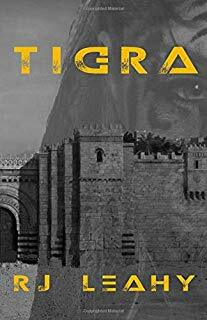 Tigra, by R.J. Leahy, gave me a pleasant surprise. I’m going to go really light on synopsis and spoilers, as this is a recent release, and I think this is one of those sci-fi tales with enough unique flair of its own to warrant an unspoiled read. What I will say is that Leahy has a clear grasp on how to write visceral scenes, and at evoking terrific imagery in the reader’s head. I had a pristine picture of the fictional world, Ararat, in my mind, and the chapter where our protagonist first breathes in this new place will be a moment I’ll cherish as I look back on this in the future. The lead character, Jeena, is a spitfire, tough-as-armor soldier who became a POW in a dreadful, future civil war in space, and is forced to survive on Ararat after narrowly escaping. How she does so is interesting and vividly told. Almost like being along for the ride with Survivorman, we go with Jeena through her tribulations as she adjusts to the alien world, and slowly unravels the truth behind the forgotten civilizations there. The author cleverly intersperses myth and science fiction as the story unfolds, and a few things get turned on their heads in ways that I found fascinating. So we have a vivid setting, overall great characters, plenty of believable conflict and intrigue, and a compelling plot, that was paced well aside from perhaps moving things along too fast toward the very end (this may have only been my perception, as I contrast the end of the story against the more deliberate beginning). As of this post, with the version I read, there were unfortunately some editing errors that marred the manuscript. They mostly weren’t egregious enough to stop me from enjoying the story, but a few of them slowed down my comprehension of certain scenes, so I do feel obligated to mention them. Despite a few hiccups, I thoroughly enjoyed my time reading Tigra, and was surprised and engaged by its twists, turns, characters, and vivacious scenes. I definitely recommend that science fiction fans give this a chance, especially those intrigued by stories set against the backdrops of galactic war and mythologies cast to the stars in upheaval. Check it out on Amazon, link is below, for your convenience.